Coming to Chi-town and not catching a Cubs game borders on sacrilege. So don't be that guy or gal. No matter why you're in town, grab some tix and head to Wrigley Field for a few hours of brews, burgers and legendary baseball in The Friendly Confines. Check out the National League's oldest ballpark, where the ivy-covered outfield wall is the prize for baseball's greatest sluggers. Feel the vintage vibe with the hand-turned scoreboard and iconic red marquee. There's nothing like the Wrigley Field Chicago experience. Just be sure to #latergram the proof. You know, in case you're supposed to be working. Ticket prices vary based on seat location and game. Hours vary based on game schedule. What items are prohibited from Wrigley Field? If you're coming to Wrigley for a Cubs game, please leave the following at home: alcohol, bags bigger than 16x16x8 inches, brooms, cans, glass containers, hard-sided coolers, thermoses, flasks, illegal drugs, inflatables, laser pointers, luggage, car seats, nets, noise makers, non-factory sealed plastic bottles, drones and weapons. Oh, and ballpark operations personnel have the discretion to prohibit anything they deem inappropriate. Quite a list, but better safe than sorry! 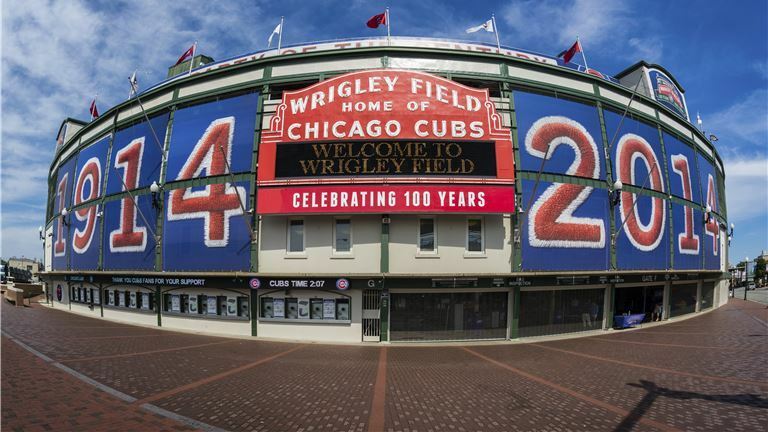 What's the easiest way to get to Wrigley Field? Public transportation on the Chicago Transit Authority (CTA) is the recommended way to get to the ballpark. The CTA Red Line stops directly at the Wrigley Field Addison station; CTA Bus #152 (Addison) and Bus #22 (Clark) both stop at the intersection of Clark & Addison streets. You can get more info on CTA options at www.transitchicago.com. There's also free bicycle valet service for all home games on Addision Street by the CTA Red Line stop.